Ba3d region has well separated spin-orbit components (Δ=15.3 eV). Loss features may be observed in the Ba3d reigion at 791eV and 806eV. Direct overlap between Ba3d and Co2p peaks. Although Ba3d / Co2p peaks have strong overlap, Ba3d spin-orbit components have a 3:2 intensity ratio compared to a 2:1 ratio for Co2p. Check for the weaker Ba4d peak, if barium concentration is high enough. Primary uses for barium are in fireworks, vacuum tubes, fluorescent lamps, and sparkplugs. 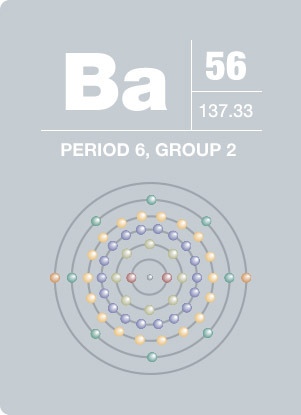 Barium, meaning “heavy” from the Greek word barys, was first discovered by C. Scheele in 1774. It is extremely difficult to obtain this metal in its pure form because of the element’s nature to quickly oxidize in air. This metal is also extremely reactive with water or alcohol. Being that water or acid soluble barium compounds are extremely poisonous, the compounds should be handled with great care. Because barium sulfate does not dissolve and will completely rid from the digestive tract, it can be used in medicine. This compound is often used in radiography studies of human swallowing. Small amounts of barium compounds are used in paints and glassmaking.